1. Is coached with a positive, encouraging attitude by the best talent we can provide and where good sportsmanship is a fundamental principle. 2. Has a safe atmosphere, playing grounds and experience. 3. Has fun playing the game. 4. Is a part of the team regardless of performance and where teamwork is recognized as a primary goal of the season. 5. Learns baseball, the skills, tactics and strategies of the game and improves as a player. 6. Learns other "life lessons" that have value beyond the playing field. 7. Is encouraged to return to baseball next year for an even better experience! We are commited to creating a culture in which coaches, parents, fans, umpires and athletes work together to achieve our mission and have a place to return next year that will provide the same goals and environment. 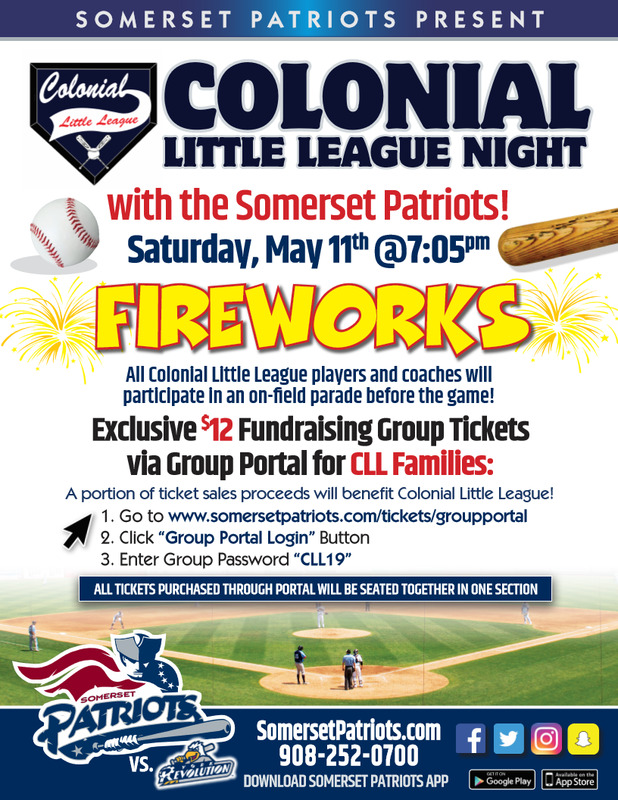 We are excited to announce that we will be offering a Colonial Little League Night with the Somerset Patriots baseball team on Saturday May 11th @ 7:05pm with fireworks to follow immediately after the game!! In addition, ALL Colonial LL Players and Coaches will participate in an on-field parade before the game! Click on the link below that will take you to the online portal to purchase your tickets. Click on the blue "Group Portal Login"
The cost is only $12 per ticket. ALL tickets purchased through the portal will be seated together in one section. All Players who live or go to school in any of the Towns listed above are welcome to register. We are not a travel league, there are no tryouts necessary to be on a team. All Registered players will be on a team and have playing time. Who Is Colonial Little League? Colonial Little League was organized and officially Chartered by Little League International (Williamsport Pa.) in 2013 by a group of people who wanted to bring a "better brand" of Baseball to our Community and more importantly, our youth. Rules - Colonial LL plays by the rules set forth by Little League International which all Managers and Coaches are given access to via the Little League Rules books that are handed out each year. These rules include a strict pitch count to protect our young arms. Code of Conduct- Colonial has a sound Code of Conduct Policy/Parent Player Pledge which ensures that the conduct of the Coaches, Players and Parents does not interfere with the Colonial Little League Mission Statement. Umpires- We bring quality, trained and experienced Umpires who know the rules of the game well . Free Winter Clinics- Over the previous Winters Colonial LL has held indoor clinics which are free and available to all registered players. In 2018 the Clinics will begin in January and continue through March. Colonial LL is currently run by a 10 person, Volunteer Board of Directors from within our community. The Board is responsible for the day-to-day operations of the league within the rules, regulations and policies of Little League International. For the 2018 season Colonial LL is very pleased be partnered up with the Independence Township Recreation Committee, Allamuchy Township Recreation Commission and the Liberty Twp. Recreation Committee to provide Recreation Baseball for their respective Townships for players ages 5-14. For more info click on our Frequently Asked Questions page. Little League Baseball and Softball has launched the online destination of its new training and education platform, Little League University. LittleLeagueU.org is designed to transform the way volunteers, league and district administrators, coaches, and parents experience learning about the Little League program.